Whether you’re opening a new gym or remodeling your existing one, it’s important that you choose the best flooring for your facility – gym flooring is key for a safe and efficient workout environment, so you need to find a flooring system that perfectly suits your needs and purposes. 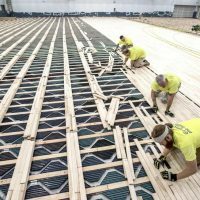 Commercial gym flooring needs to be strong and durable (to support heavy equipment and machinery), must provide excellent resilience and shock-absorbance (to protect athletes and prevent injury), and should be easy to clean and maintain (to ensure proper hygiene and user comfort). Besides, it has to be artistic and aesthetically pleasing in order to attract the public. 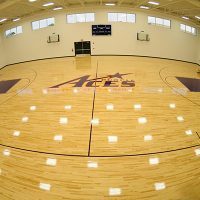 There are many good commercial gym flooring options available on the market, all of which have their own specific pros and cons that make them suitable for different kinds of sports. Unless you have a specific niche, however, chances are there will be a variety of workouts taking place in your gym. 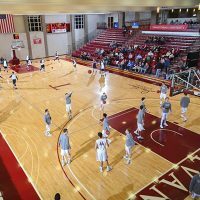 So, you’ll most likely need to find a flooring solution that is versatile enough to handle a diverse range of activities and exercises. 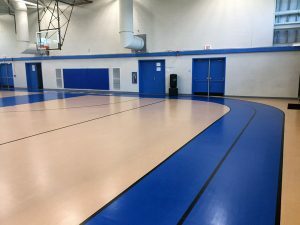 To pick out the right fit for your gym, you need to be familiar with the benefits and drawbacks of each flooring option and to know the answers to the most important questions concerning commercial gym flooring. Yoga studios and health clubs need a comfortable floor that will provide members with a pleasant and relaxed experience; etc. Since commercial gyms are used for a wide range of activities and, therefore, need a great deal of versatility, the most popular flooring options for these facilities are rubber flooring products and gym turf materials. 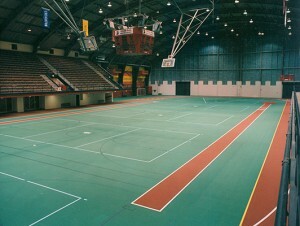 Rubber flooring rolls are the most widely used commercial gym flooring option. They are extremely durable and very economical and offer an elegant seamless appearance (when installed correctly, it is nearly impossible to see where one roll ends and another begins). Rubber rolls come in sheets that are four feet wide and can be twenty to fifty feet long, allowing you to completely cover a large area with just one or two rolls. They’re available in a variety of thickness options to suit different needs and requirements. The thicker the material, the more expensive the flooring is going to be, but it will last longer, will be softer underfoot, and will provide better cushioning, shock absorption, and sound absorption. Keep in mind though that rubber rolls are very heavy and cannot be installed by one person alone. 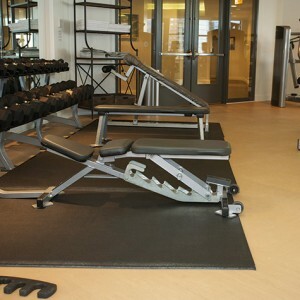 Durable, affordable, and easy to install, rubber tiles are also very popular for commercial gyms. They’re available in different square sizes and can be easily cut into different shapes of varying sizes to perfectly fit the layout of the gym. The rubber tile thickness for commercial gyms varies. 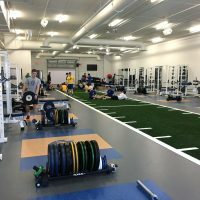 When it comes to weight room flooring, for example, the 5/16” rubber floor tiles are a good choice as they provide proper protection to the subfloor from dropped dumbbells and other weights which have a small point of contact with the floor and, therefore, pose a greater risk of damage. Most rubber tiles have puzzle-style interlocking edges that come together very easily and make installation extremely convenient and simple. If one tile is damaged, it can be easily removed and replaced. However easy the installation may be though, covering a large space with rubber tiles is very time-consuming. Besides, tile flooring can never be quite as seamless as rolled rubber flooring. Rubber mats are extremely versatile – they can be laid on any hard, flat surface to add extra cushioning or thickness to the area, however small it may be. Rubber floor mats come in many different sizes to fit any space – from 3”x6” to 4”x10” and more. You can choose from a variety of thicknesses as well – from thin 1/4” mats for bodyweight exercises all the way up to 3/4” mats that are specially designed to handle the impact of heavy weightlifting and dumbbell exercises. Gym floor mats offer the best solution for small spaces like weightlifting areas or cardio areas – you don’t need 1/2” or 3/4” thickness over your entire gym floor, but you can use the ultra-thick and durable mats in heavy lifting areas and underneath heavy equipment. Rubber mats can be installed next to one another to cover larger surfaces (you may want to consider mats with interlocking edges for a more secure installation), but they’re intended for smaller areas. If you have a big space to cover, it is better to go with rubber tiles or rubber rolls, both financially and time-wise. To sum it up – rubber mats are the best flooring option for small spaces (they will save you time and money) and areas subjected to heavy impact, like weight rooms (since gym floor mats are specially designed to hold up to heavy weights). As an added bonus, you can easily change your setup by simply picking the mats up and moving them where you want. Affordable price: Not only do rubber flooring products come at a lower cost than wood flooring, but they also have smaller maintenance requirements (and therefore, smaller maintenance costs) and a very long life-cycle that reduces the need for frequent replacement. Color instability: While rubber flooring is resistant to most staining agents, there are some products, such as grease and oil, that can discolor its surface. Also, color fleck rubber products are not UV-stable and need to be protected from direct sunlight to preserve their colors. Turf is another great flooring option for commercial gyms. It gives the gym the look and feel of real grass, while increasing agility and mobility and providing a safe and resilient playing surface. Gym turf tiles – Gym turf tiles are ideal for covering oddly shaped areas – they can be easily cut to fit any space. Just like rubber tiles, turf tiles interlock together like puzzle pieces. 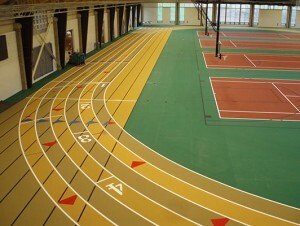 In terms of durability and performance, gym turf tiles are equivalent to gym turf rolls. 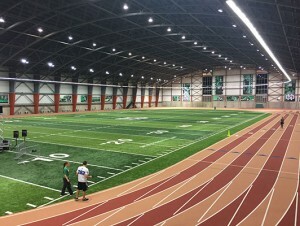 Gym turf flooring makes a great surface for speed, strength, and agility training because it absorbs impact well and ensures the safety of athletes. Aesthetic appeal: Green and fresh at all times, synthetic grass is very pleasing to the eye. 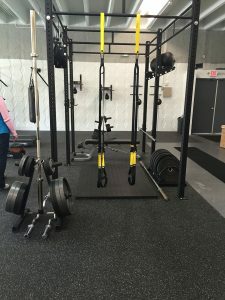 Turf flooring, however, is also available in white, black, blue, tan, pink, and red, so you can choose a unique color and style for your gym, giving it a sleek, modern look. Higher cost: Artificial turf is one of the most expensive commercial gym flooring options. Q1. What is the most popular flooring option for commercial gyms? Rubber gym flooring rolls are by far the most widely used commercial gym flooring option. Q2. How thick should commercial gym flooring be? 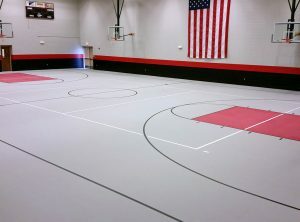 There is a common misconception that commercial gyms require 1/2” rubber flooring, but that thickness is only recommended for parts of the gym that are subject to heavy impact activity (such as weightlifting areas). Otherwise, the standard in the industry is 3/8” thick flooring. Q3. What type of commercial gym flooring will work best in a weight room? 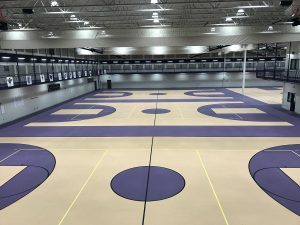 Rubber flooring is the perfect option for a weight room as it is dense and sturdy enough to withhold the extra weight without bending, breaking, or denting and resilient enough to provide bounce back and cushioning for dropped weights. Rubber rolls and interlocking tiles are both suitable even for the most intense training. Q4. What are the cleaning requirements for commercial gym flooring? It depends on the type of flooring. Most options only require a simple cleaning solution of mild soap and water, but each flooring product comes with its own specific instructions on cleaning and maintenance. Hire experienced and trustworthy professionals to install your gym flooring. 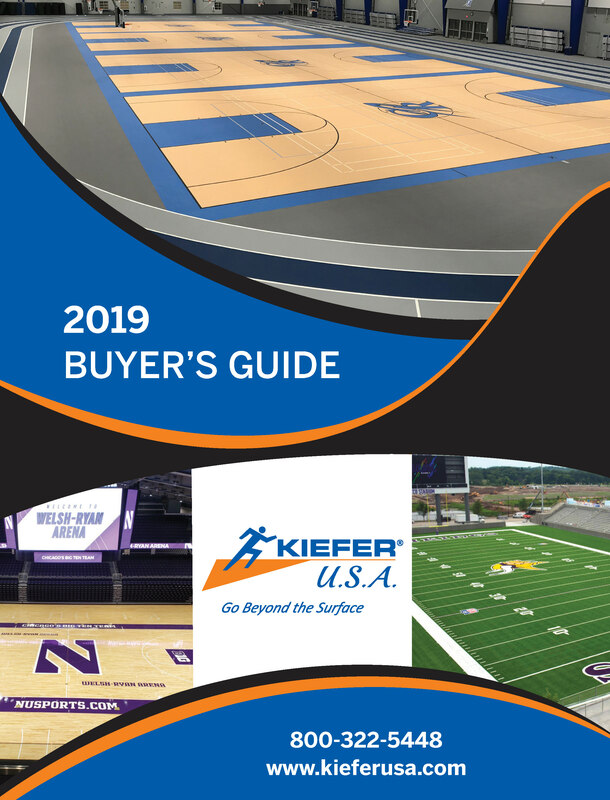 If you have any further questions or need professional advice, do not hesitate to contact KieferUSA – we provide quality commercial gym flooring solutions at affordable prices and have the professional knowledge to help you pick the best sports flooring for your facility. 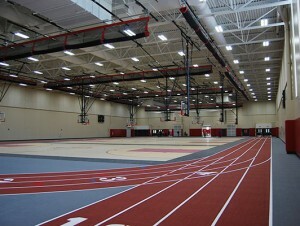 You can count on us to install your chosen gym flooring as well. Just call us at 800-322-5448 to discuss your project with our experts and find the best solution for your needs.